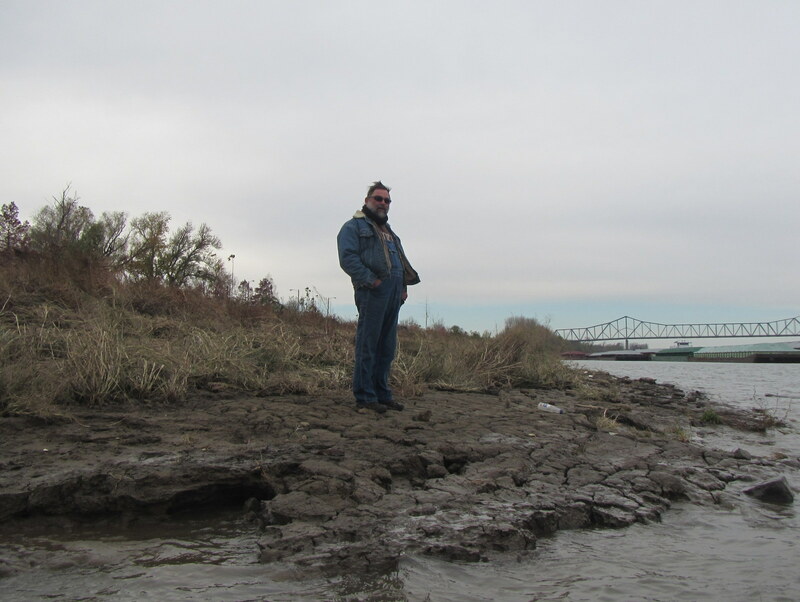 If the river doubled at St. Louis, it doubles again at Cairo. First came the Missouri, the river’s western branch, swirling in above that beautiful arch. Now comes the Ohio, the broad eastern branch, to join the Mississippi’s winding march toward New Orleans. Sharpened to a muddy point, a narrow slice of land separates the two rivers. A man stood there, wrapped in jackets and a knit cap against the cold, and asked me if I was going to stop. A few minutes later, Mike led me up to the parking lot where his old aluminum canoe sat on a homemade trailer. He pulled a two gallon jug out of the dented hull and started pouring it into my bottles. A moment later, we were telling stories, the kind that you only understand if you’ve been on the river, the inside jokes and worries, the little things that matter. Stories about barges and getting yelled at, about how scary St. Louis is in a little boat and how giant the bridges are from the river, about thunderstorms and rising water, about muddy banks and sliding feet, about wind-bound days and moonlit nights, about backwater sloughs and open lakes, about waiting for locks in crashing waves and how small you feel as the water lowers in the chambers, about finding the perfect sandbar and random strangers helping you on the way. It’s not that you can’t tell these stories to others, I tell them all the time, it’s that they will never quite understand, never quite get it all, because they weren’t there and don’t know the thousand little details that go unsaid, details that would weigh down and sink a story if you had to explain them all. For the same reason best friends can laugh together at a single word, because they understand each other, Mike and I laughed and told stories. “Yea,” I said, laughing at the frailty of emotions, the way they swing so sharply out here. He held out a finger on each hand. He brought his two fingers together and smiled. Posted in Angle to Key WestTagged Angle to Key West, cairo, helpful strangers, Mindset, mississippi river, ohio river, river ratsBookmark the permalink. Great story D and the ending thought was beautifully sweet!!! Oh man, I love this one. Tears…thank you for a beautiful story! Awesome story. Daniel, you have a real talent for writing. makes a girl want to jump in a boat. go jump in that boat girl! merry xmas to you both. thinking of you and so happy for your adventures these next few days!! !